Meghalaya chief minister, Conrad K Sangma, expressed concern over fake news and rise of cyber crimes in this age of technology and urged media persons to perform their duty responsibly. 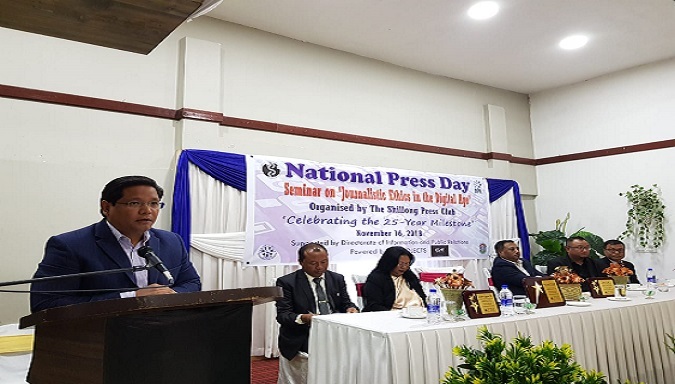 Greeting media persons on national press day, Conrad said that issues concerning the welfare of journalists and media houses would be addressed by the government, while informing that critical issues would be first taken up within this financial year. Emphasizing the need to adapt to digital change, he was confident that print media would never cease to exist. The tech-savvy chief minister also shared his government’s plan to start smart village projects in the state. He also asked the media to make sure that facts must come out as it is the job of the press to tell to people facts and also criticize the government on anything for the good of the state. Conrad also stressed the need to create more awareness about cyber crime which affect the people through the use of technology. “We have to do a lot to ensure proper mechanism and technology is in place. The threat due to cyber crime is a wakeup call for all of us and the government,” the chief minister said while assuring to take measures to ensure that technology would be used to monitor things legally.